Things are getting hot and heavy in the most popular sport. Oh, wait. You thought we meant the NASCAR Monster Cup Series Playoffs? Oh no, no, no. I meant the most popular team sport in the world. No, we don’t mean the Major League Baseball playoff push, nor do we mean the opening weeks for the National Football League. Of course, we mean the qualification stages for the 2018 FIFA World Cup in Russia, which is less than a year away. Because of the timetable, more than 200 national teams have been competing in various confederation tournaments to fill the 32 precious spots in the most important event in the world of soccer. 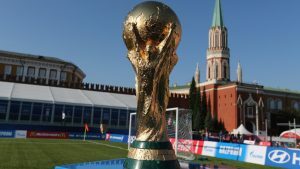 When qualification started last year, 209 countries put national teams on the pitch in six confederations (one on each continent), with each having pre-determined numbers of berths in the field, with host country Russia getting the benefit of automatic qualification. As of the middle of September, eight of the 32 spots have been filled thanks to efforts by some countries in their confederations. So far, Africa and Oceania have not qualified any teams for Russia, while South America and the North America/Central America/Caribbean confederation each qualified one team (Brazil in the former, Mexico in the latter) so far. Belgium and Russia have qualified out of Europe, and Asia will be sending South Korea, Japan, Iran and Saudi Arabia, with a fifth team playing in a playoff for a single spot. The confederations break down as such – Africa will send five teams to the showcase; Asia four (with a fifth in a playoff vs. North/Central America), North/Central America three (plus one in a playoff vs. Asia), Oceania will have one team in a playoff for a berth, South America will send three (plus one in a playoff vs. Oceania) and Europe will have 14. The United States, by the way, is still in the running for a World Cup spot, as its North/Central America confederation is in Round Five of qualifying, which is a six-team round-robin. The top three teams out of that round-robin will qualify for the World Cup (Mexico plus two others), with the fourth-place team playing a team from Asia in a two-game playoff for a spot. The USA is in the final round-robin group with Mexico, Costa Rica, Panama, Honduras and Trinidad & Tobago, and that will be played during October and November of this year. The 32 teams will be divided into eight groups of four teams at the World Cup in a round-robin format, with the top two teams in each group advancing to the “knockout,” or elimination-round tournament of 16 teams. When you consider attendance figures and the television ratings all over the world with various soccer leagues and these international tournaments, soccer is the most popular sport in the world, and it is a sport that countries other than the U.S. excel and can dominate. National pride and glory are always on the line at a World Cup, and the drama and intensity in unparalleled compared to any other playoff system in any league. Imagine an NFL team playing as many as seven Super Bowls over the course of a month, and you get the idea of the significance of this tournament.